The Nantahala River has two different sections for trout fishing. The Upper Nantahala has 4 miles of great wade fishing water. It is stocked regularly by the NC Fisheries Department. Starting October 1, it is a “Delayed Harvest” stream. That means single hook artificial, catch and release only fishing. Water conditions on the Upper Nantahala are almost always good. Check with the local fly shops to see what flies are working best. The main stem of the Nantahala is considered to be one of the best tailwater streams in the Southeast. The river can be wade fished early in the morning and late afternoon, before and after the power generation releases. Be aware that the river can come up quickly. It is not a good place to get caught mid-stream with waders full of water. Water temperature varies from 60 degrees with the water off to 50 degrees during releases. The best way to fish the river with the water on is to do a float trip. Fishing it with the water on is a real treat. There are lots of rainbow trout to be caught and also the occasional monster brown trout. The state record brown trout has come out of the Nantahala two times. Last year a potential state record brown trout was caught and released. In order to register for a state record fish you have to kill it. Most guides will discourage this and release fish back into the stream. Spin fishermen usually do well with small spinners and bubbles with a variety of flies attached to their lines. If you plan to fly fish, try small nymphs and dry flies. Casting wooly buggers and streamers is a great way to catch big brown tout. 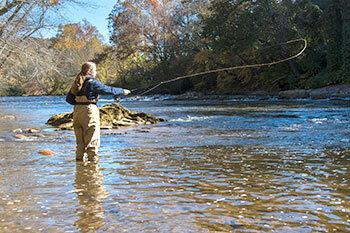 The Little Tennessee is considered to be one of the best smallmouth streams in the southeast. There is an abundance of fall smallmouth bass, brim and redeye bass in the Little T. Make sure the water in the river is clear before you go. If you are spin fishing, you will do well with small rapalas and crayfish imitations. If you are using a fly rod, the most fun can be had with poppers and streamers. The Little Tennessee can be waded or fished from a raft. This is a beautiful river with some sections that are quite remote. Be aware that after the beginning of October the smallmouth fishing on the Little T will drop off substantially. Be careful! Do not use waders on the Little Tennessee. The water is warm enough that you won’t need them. Wear a good pair of wading boots to protect your feet and avoid slipping or falling. It is very easy to step in over your head. Always wear a life jacket while wet wading the Little Tennessee. WNC high school freshman angler casts in the Tuckasegee River Delayed Harvest waters in downtown Bryson City. Swain County is excited to offer anglers a new 2.2-mile section of “Delayed Harvest” water on the Tuckasegee River as it passes through Bryson City. 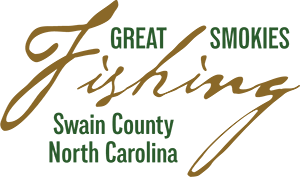 Look for the Wildlife Commission diamond signs posted on streamside trees to determine the boundaries for this delayed harvest section, which is from the easternmost bridge on Hwy 19 at Darnell Farms to the westernmost bridge on Slope Street. This section of the river will be stocked regularly with all three species of trout until almost 48,000 trout. are in the river. The Tuckasegee River is also a great stream to find brim, red eye bass, smallmouth bass and spotted bass. Remember that on “Delayed Harvest” streams you must fish with single hook artificial flies or lures. It is catch and release only for trout, so crimp the barbs on your flies to make releasing fish easier. If you plan to spin fish the Tuckasegee River during the delayed harvest season, remember to use just a single hook. If you are planning to fly fish, check with your local fly shops for suggestions on what fly is working. The Tuckasegee can be waded or fished from a raft. Be very careful! It is easy to step in over your waders. Also check the release schedule as water can rise rapidly in the river. It is always a good idea to wear a life jacket when wading the Tuckasegee. Some of the best Fontana Lake fishing of the year can be experienced as the water temperatures and water levels begin to drop during the fall and winter months. As summer goes, so does identifiable structure such as shade lines and blooming vegetation. A critical understanding of the food chain is needed as winter approaches. Larger baits and slower presentations are key. Predatory fish will look to consume more calories than the energy they expend feeding. The main forages to replicate on the lake are gizzard shad, trout, and crayfish. They can be imitated with suspending hard plastic crank baits, weighted jigs, and soft plastic tubes. Trout, walleye, and mixed schools of black bass can be targeted with umbrella rigs, crank baits, and spoons trolled at depths of 20-60 ft. Shallow water anglers can target smallmouth bass, largemouth bass, spotted bass, white bass, and walleye around rocky points and river break lines on light tackle. Catch and release; that way there will always be fish in our lakes and streams.